The 1979 season was one of two halves in the first half the french Ligier team came out of nowhere with a fast car that took three wins from the first five races, Ferrari then muscled in with four race wins from five races and Renault scored what would turn out to be a one off win at the half way mark and the second half of the season was dominated by the Williams team who scored 5 wins in the last seven races with the Ferrari drivers Jody Scheckter and Gilles Villeneuve picking up the pieces and each scoring a win. 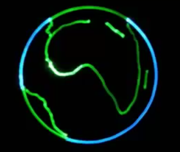 Jody through his better consistency beat Gilles to the 1979 World Championship. 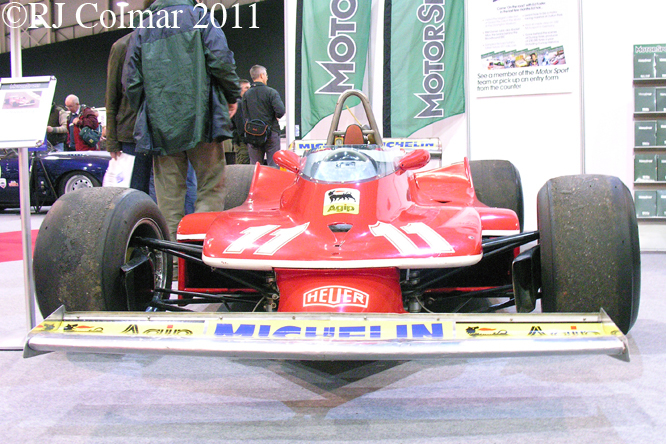 The car that Jody and Gilles used in 1979 was the Ferrari 312 T4 an improvised ground effect design by Mauro Forghieri that was compromised by the powerful 180 degree 3 litre / 183 cui V12 motor that got in the way of the under body aerodynamics that were an essential element for giving the car improved aerodynamic grip and cornering adhesion. By their own admission early season runaway leaders Ligier had no idea why their car was working so well in Argentina and Brazil, and when a slight change was made to the material specifications of their ground effects design they had no idea why it continued to work so badly. Meantime Ferrari had just the right balance of mechanical power and reliability coupled with just enough aerodynamic grip to capitalize on Ligiers misfortune and first Gilles, in South Africa then Long Beach and then Jody, in Belgium then Monaco, took two wins a peace interrupted by third and final win for the Ligier driven by Patrick Depailler in Spain. During the second half of the season Frank Williams team after many seasons operating out of a GPO telephone box on a shoe string budget finally juggled all the balls in the right order and came up trumps with a clean design that once it had become reliable was the class of the field for the second half of 1979 with five wins from seven races in Britain, Germany, Austria, Holland & Canada . Only Jody and Gilles spoiled the Williams party Scheckter securing the drivers championship with a win in Italy to become the first, and so far only South African Drivers World Champion. 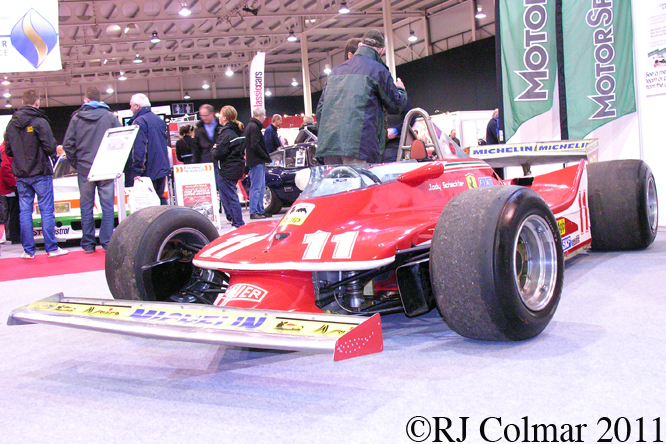 Jody, who once observed that when he was racing for Ferrari he was driving for Italy, took all three of his championship wins driving chassis #040 seen above at last years Race Retro. 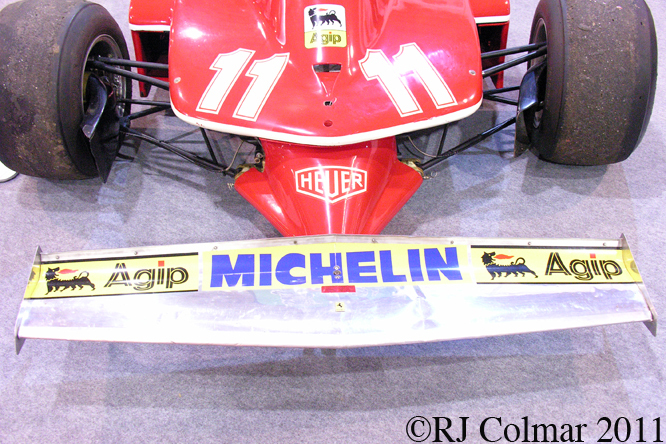 Gilles Villeneuve came second in the 1979 championship his season being primarily remembered for one of the all time great dices in the history of Grand Prix when he pulled off an amazing second place finish racing wheel to wheel over several laps with third place Rene Arnoux in the French GP at Dijon. 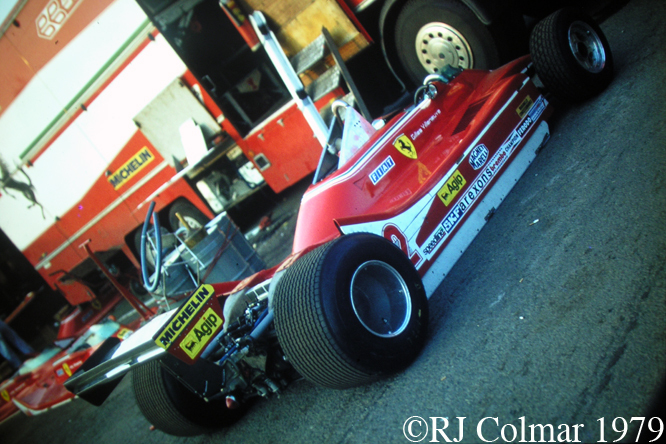 Gilles chassis #038 seen above in the pits at Silverstone, where the Ferrari’s were uncharacteristically completely out classed, is known to have been driven to second place finishes by Scheckter in South Africa and Long Beach and a third second pace finish with Villeneuve at the wheel in the 1979 Italian GP. It would be 21 long years before another Ferrari driver would win a World Championship though as we shall see in the coming weeks Ferrari did manage to win a couple of constructors championships in the 1980’s. This entry was posted in Uncategorized and tagged 312, Colmar, Ferrari, Forghieri, GALPOT, Mauro, Race, Ralph, Retro, Scheckter, Silverstone, T4, Villeneueuve on February 17, 2012 by Ralph.